“Stay at the Palace next to the Cathedral.” If you were in an English city, such advice would mean lodging with the Anglican bishop. Very pleasant, no doubt. But we are not in the shires of England. We are in The Big Apple, the town which young people like to emblazon across their t-shirts, the city of go-getting excitement and glamour. Yet, if you are looking for luxury in a stunning location in the very heart of Manhattan, our opening injunction is absolutely spot-on. For, right next to the gothic magnificence of the Catholic Cathedral of St Patrick, is one of New York’s very best hotels – the New York Palace. Its soaring 55 floors on Madison Avenue accommodate 900 rooms. This is large, by anyone’s standards, and it means that the hotel can offer some seriously impressive facilities – like a fitness centre which covers 7,000 square feet. Perhaps, however, this strikes you as too big, and you prefer your lodgings to be on a smaller scale. Fear not. For the Palace allows you to have the best of both worlds. It offers The Towers – the ‘hotel within the hotel’. By choosing this option (as I did), you can not only enjoy the vast public spaces of the main hotel, but also feel truly cosseted by the more intimate scale and by the highly personalized service of The Towers. I was delighted, as soon as I arrived, to be ushered out of the busy lobby, through double-doors, to the separate check-in of The Towers. A moment later and I was in the lift, heading for the 47 th floor. Now, how long do you suppose it took the lift to ascend so far into the sky? I timed it. Just 35 seconds. They call these ‘express lifts’, and they are right. Within five minutes of my taxi stopping outside the main entrance, I was in room 4707. This was the sort of spacious and comfortable apartment I wanted in New York. 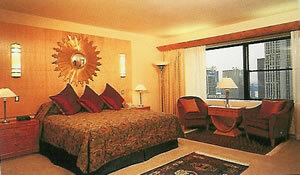 Art Deco is always a good style for hotel rooms. Here it meant light maple wood for the furniture, silver and black for the mirrors and side tables and light fawn for the carpet – the whole enlivened by large, colourful prints on the walls. On top of a writing table of substantial proportions was my own fax machine. Within the walk-in wardrobe was the largest safe any hotel has yet provided for my personal use. And, best of all, was the view through the giant window. I sank into one of the two brown easy chairs and gazed out at the skyscrapers and the far-off East River. I have mentioned the personalized service. I will detail but two examples. First, a few moments after my arrival, the door-bell rang. It was the Maitre d’Étage, a fine fellow who explained the working of the room and who was most solicitous that, should the slightest need occur to me, I must not hesitate to call for his assistance. And second, laid out on my desk I found a supply of stationery and business cards – all printed with my name, the address of The Towers and the legend, “In Residence”. I breakfasted in considerable grandeur. One of the chief glories of the Palace is the block of late 19 th century houses which spans its Madison Avenue frontage. One of these Villard Houses used to be home to the Archbishop of New York. They were designed by McKim, Mead and White for some of the grandest plutocrats of the 1880s and are full of stucco, crystal and gilt. I tried each morning to select a table in the Istana Restaurant on the ground floor which would allow me to sit as close as possible to the mighty staircase of the original building. I do like the proximity of marble columns with my orange juice, don’t you? As I walked in and out, I would look up and admire the apse of St Patrick’s Cathedral, towering over the glass doors at the top of the stairs. In between my entrance and my exit, waiters in striped waistcoats brought to my yellow tablecloth Allbran and banana, crispy bacon, poached eggs, croissants and pots of strong coffee – all of excellent quality – for $30 to $40. Sitting in a red velvet armchair, with a buzz of activity all around, I was content to linger over breakfast in this lovely setting. 455 Madison Avenue (between 50 th and 51 st Streets), New York, NY 10022-6809, U.S.A.